Why Isn’t Men’s Ministry More Vibrant in the Church? Recently, I had the opportunity to go on a weekend Catholic men’s camping trip. 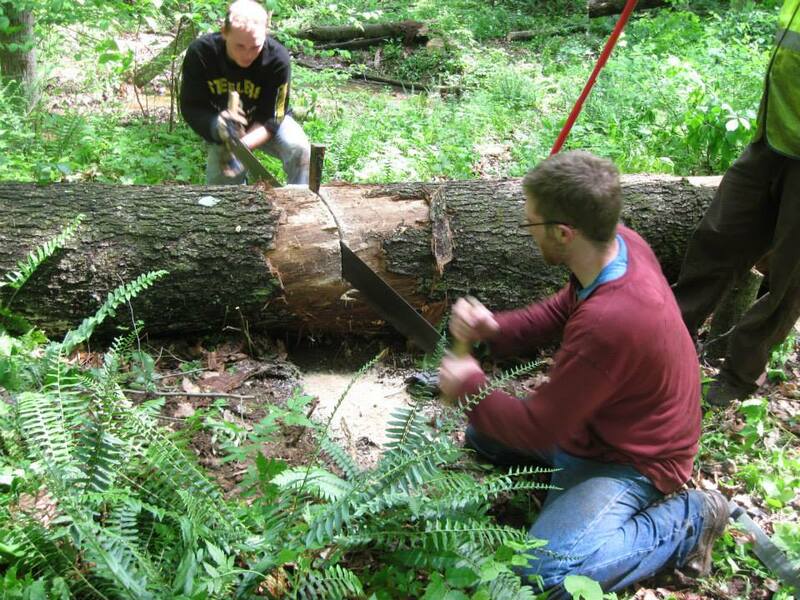 During our time in the wilderness we had the opportunity to discuss masculine spirituality as well as use cross-cut saws to cut away trees that had fallen on the state park’s hiking trails. My friend Mike and I left the weekend refreshed in both mind, heart and body. Not only we had worked hard to clear the trail, we had some deep intellectual discussions about what it means to be a man of God, and to top it off, a priest hiked a mile into our campsite to celebrate the vigil Mass for us on Saturday night. Throughout the weekend, we reflected on the ways that men are engaged by the Church and areas that need some improvement. For example, if there is any form of men’s ministry at a parish, it often consists of a weekly or biweekly discussion ranging from the Gospel, to the catechism, to what is going on in a man’s life. Frequently these meetings have good intellectual and spiritual content, but lack any sort of physical element. On the other hand, men may be involved in service projects at the parish, such as cooking at the fish fry, setting up booths for the parish festival, or collecting clothes for the homeless without any sort of prayer or discussion in how the service they are performing relates to their spiritual lives. Because of this lack of a holistic approach of outreach to men, it is no surprise that there are few men involved in the Church. So, what do we do to improve this? Well, first we need to pray and ask for God’s help in this task. However, on a practical level, I believe the area we need to improve on most is to incorporate physical challenges into men’s outreach. One important thing to remember in starting these new initiatives is that we do not need to reinvent the Church. Creating flashy programs or fun physical challenges for men to accomplish is not our end, since these activities are meant to draw men into a deeper relationship with Christ. We have the fullness of truth in the Catholic Church, but as a part of the New Evangelization, we need to look at new ways to bring men to Christ. So, what are your thoughts on men’s ministry in the Church? What has worked in your parish or diocese? What could be done to improve this? Bob Waruszewski is a cradle Catholic from Pittsburgh, PA. He graduated from St. Vincent College with a bachelor’s degree in mathematics and economics. Currently he works in the energy industry in the Pittsburgh and is enjoying life as a married man and father to his one year old daughter. He enjoys hiking, reading a good book and competing on the athletic field. To answer the question posed in the title: because of the watered-down, chickified, Jesus was a really nice guy riding on eagle’s wings, one bread one body, wimpy, be a good little Christian and don’t offend anyone, box in which some churches have stuffed the radical nature of the Catholic religion. Jesus was one tough dude who publicly humiliated the religious leaders at the time, introduced radical teachings, hung out with prostitutes and tax collectors, and was ultimately executed because of the radical nature of his life and teachings, and the political threat he posed to the Pharisees. This doesn’t sound like afternoon tea at the Christian book club or like the donut social club after Mass. Maybe men should initiate men’s groups – just get together with your friends twice a month and see what you end up doing together, then after a while elect a president and invite other men to join. Churches have women’s groups up the wazoo because women chat with other women, share ideas, recipes, clothes, babysitting, etc. with other women, and then they decide they need a secretary and a steering committee. We network naturally, and groups just happen. I think men have fewer groups because many of them are at the office all day then with the family all evening, and they don’t have as much time for men’s groups at church. On top of that, I think men aren’t as naturally social, so a men’s group is less likely to just “happen” than a women’s group. There’s my two cents! I agree, Mary, and I also think that the age of the men who are involved with the parish is a factor. Most are seniors and they aren’t into physical activities anymore. Sitting on a comfy couch for Men’s Bible Study is about what they can handle. Now maybe if you offered physical activities you would get younger guys involved (build it and they will come) but given how busy Dads are I don’t know how many you’d get. My husband and the men in our peer group of families with kids are maxed out. The Dad just doesn’t have time for parish groups until the nest is empty. It’s shuttle kids here and shuttle kids there. check out our movement in Australia called Young Men of God. we do men’s groups, national conference, formation, brotherhood, sports, pub nights. Yes, I have. And I’m disappointed to report that the show’s regulars can’t imagine a man who isn’t cheating on a female, beating up a female, or failing a female somehow. Compare and contrast the attitude of the Crossing the Goal (CTG) hosts toward men with, oh, to pick one example, the attitude of the Women of Grace hosts and guests toward women. For bonus points, compare and contrast CTG’s show aired around Mother’s Day with the one aired around Father’s Day. Oh, it sounds like you went on an ‘Into the Wild’ weekend. My husband started a Catholic Men’s Fellowship in our parish. Starting with a low commitment (my husband’s group meets once a month), personal invitation is crucial, and getting men to see their spirituality first is also vitally important. As my husband says, many men see their lives as a work of service, but without the spiritual basis, that isn’t going to have as much meaning. Some of the most active men in my husband’s group were prodded into coming by other men or their wives. Chris Ricketts I agree with your assessment. I enjoyed Wild at Heart though I wish someone would write a Catholic version to include things such as the sacraments, redemptive suffering etc. Also, I have heard good things about Into the Wild and will try to go sometime. The one thing I liked about Wilderness Outreach was that they took asceticism to a higher level than Into the Wild, though they both are good things. Mary C. Tillotson – You make a great point, men need to initiate more. MM – I understand that fathers are busy. However, I would challenge men who say that they don’t have enough time for men’s group to look at their schedule and see what is truly important for we make time for what really matters to us. I have heard of guys waking up at 5 AM to go to a weekly early morning men’s group because they know that is enriching to them. Knights of Columbus has been a major force in our diocese. Even our council — honestly among the smallest and least organized around the area — is really the crux of men in the parish. Our pastor is a knight (as is the bishop), so we’ve become sort of the central fraternal clearinghouse of internal parish service work — even those men who aren’t knights often work with us on projects or come to dinners & events we host in the Knights’ name. Meanwhile, the other successful men’s groups — more tight-knit and close-run, doing external ministry, in our Society of St. Vincent dePaul chapter (the KofC recruits and accepts those who wants to join, while SSVdP selects its membership when openings arise — if being a Knight in our parish is a sign of dedication to her, being a Vincentian is a sign of respect from her). I grew up in a parish where “men’s ministry” consisted of doing useful service projects for the parish. Cleaning, grounds work, snow removal, light construction projects. Learn by doing and learn by example, about the need to serve when needed, how to pitch in without being asked. “Let’s go into the woods” is a silly substitute. It serves no one and accomplishes nothing. As for KofC, most parishes in my area seem quite closed off to newcomers and outsiders. If your father and grandfather weren’t members, you won’t really be accepted. And also as a single man, I’ve been told to my face things like “we really like for our Knights to be married family men”. Gee thanks.